The British aerospace start-up Faradair, has revealed its intention to certify its revolutionary 18 seat, hybrid electric ‘BEHA’ aircraft (Bio Electric Hybrid Aircraft) by 2025 for passenger operations. Designated the BEHA_M1H, this hybrid-powered aircraft utilizes a design patented ‘Triple Box-wing’ high-lift configuration, delivering Short Take-Off and Landing (STOL) capability requiring less than 1,000 feet of runway. With twin contra-rotating ‘propfans’ within a vectored thrust, acoustic reduction duct that improves efficiency and reduces noise to a target of just 60 dba at take-off. After four years of development, both simulated and scale model testing, the design has evolved into a utilitarian configuration, capable of carrying 18 passengers or three LD3 cargo containers, with an internal payload capability of five metric tons. The aircraft will be able to change configuration in 15 minutes from cargo to passenger and back, and the company is already in discussion with potential civilian and non-civilian customers for this class leading capability. London to Manchester could be flown in just 42 minutes at a cruise speed of 200 knots (HS2 would take 1 hour and 8 minutes by comparison). 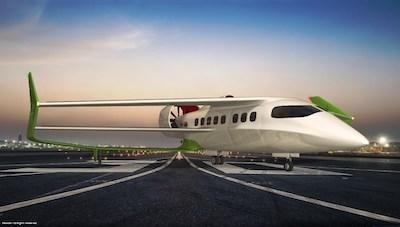 Unlike many E-VTOL projects currently proposed, the Faradair BEHA is a traditional aircraft, certifiable to existing Part 23 standards, able to operate from existing airfields but more importantly, able to operate from runways of 1,000 feet or less of any surface and be able to integrate within existing air networks. Last year Faradair secured the support of the All Party Parliamentary Group for General Aviation with 172 MP members lead by Grant Shapps MP and the support of the Chairman of the Defence Committee Dr. Julian Lewis MP, who in his letter of support noted “We should not undervalue the ability of smaller companies, like this one, to rapidly innovate new products and this project strikes me as hugely flexible and adaptable for a wide range of tasks. I would certainly encourage colleagues within Government and the public sector, along with suitable industry partners, to support Faradair in its quest to deliver the first flying prototypes of this highly versatile system." Grant Shapps MP said this of the program “The company vision for a British built aircraft that is able to deliver a range of roles both in civilian and non-civilian configuration is fascinating. The prospect of hybrid-electric flight and the ability for people throughout the UK and around the world to fly regionally as simply as taking a bus, is a future that opens up so much regional growth benefit opportunity"